No players can enter from one zone into another (Stay in your designated zone). One team is the defensive team with 3 players playing in the neutral zone and one defender in the D1/3. Play begins with the GK in the D1/3 with no defenders (&apos;A&apos;). No passes can be played higher than waist height. If the ball goes out of play, restart from the closest GK&apos;s possession. 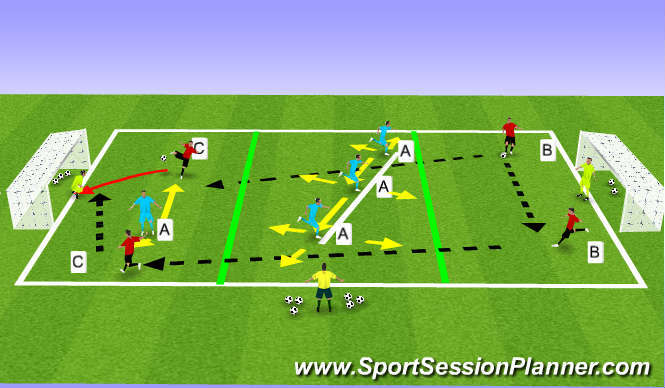 The object of the game is for players &apos;A&apos; to prevent players &apos;B&apos; from passing the ball through the defensive line in the M1/3 to Players &apos;C&apos; in the A1/3. 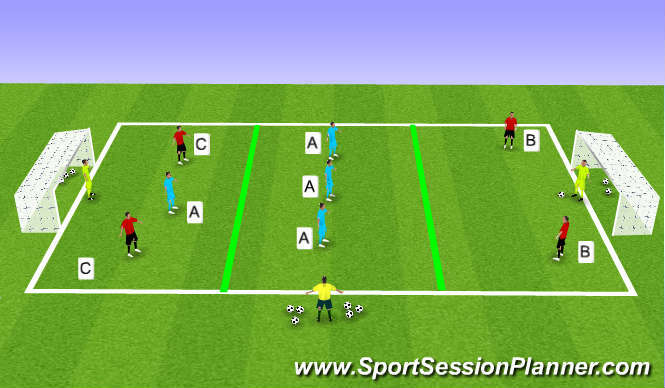 Players &apos;A&apos; are encouraged to organize themselves to be compact from side to side and end to end to not allow passes behind them nor between them. Force passes across the field until they can prevent forward passes by intercepting them. Defenders are to work on who &apos;pressures&apos; who &apos;supports&apos; who &apos;covers&apos;. Early pass recognition and communication is the key to successful blocking and interception. Read the body language of the player in possession: Ball under/out of feet; Head up/down; Open/closed Body; Speed to be proactive not reactive; mental concentration on working as a unit not as an individual. Communicate to be organized, who takes responsibility to pressure and how do the others narrow the space. As a licensed coach think of how you can progress this session and make it your own. What conditions can be removed or added to make this session even more realistic? Can this be adjusted to be played in a Small-Sided Game?